Netflix’s newest romantic comedy, The Perfect Date, stars Laura Marano as Celia Lieberman. 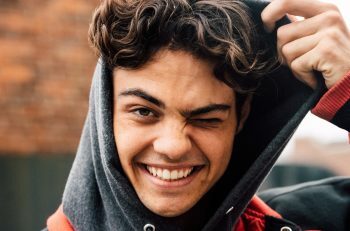 The movie revolves around Brooks Rattigan (Noah Centineo), who needs money for college. After being hired to stand-in as Celia’s “boyfriend” one night, he launches an app selling himself as a personalized plus-one for all occasions. Naturally, things spin wildly out of control until Brooks realizes the fake life he’s built may cost him the most real thing he’s found. Ahead of the film, Marano spoke exclusively with Talk Nerdy With Us about all things related to The Perfect Date, starting with how she got involved in the project. The Perfect Date came at “a funny time” in her life. Marano had a few other projects going on, and although they wanted her to be a part of the film from the beginning, scheduling simply wasn’t working out. She hadn’t even read the script yet. Time passed and they still hadn’t found anyone to play the part, so conversations rolled back to her. Marano finally read the story, “loved” the character of Celia and knew she wanted to be a part of the film. She actually infused a little bit of herself into the character of Celia. “We definitely have a lot of similarities,” she said. “I think I bring myself to every character I play, just with a different flair.” For example, she said it takes a certain group of friends to bring out her sarcastic side whereas sarcasm is “the language Celia speaks.” Although Marano believes she put a lot of herself in Celia, she said a few people from her team saw the movie and said Celia could not be more different. 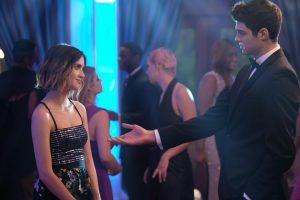 The Perfect Date was filmed in New Orleans in early 2018, before Netflix had released films like The Kissing Booth and To All The Boys I Loved Before, thereby cementing its reputation as the savior of romantic comedies. It was even before Centineo blew up as one of this generation’s young heartthrobs. Marano said it’s funny looking back on the whole experience because they didn’t know at the time of filming that it would be acquired by Netflix, let alone be part of such a cultural moment. She was just excited to be involved in the film because she felt her “generation was in desperate need of a romcom”. But now, she says she can’t imagine The Perfect Date being released by anyone other than Netflix because of what the streaming service has done for the genre. The Perfect Date is currently streaming on Netflix. Make sure you follow Laura on Facebook, Twitter and Instagram.